The separate collection of recyclables and the fortnightly collection of residual waste has inevitably resulted in greater pressures being brought to bear on the collection bin. 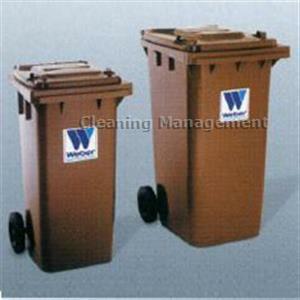 Craemer has responded to this issue with the development of the robust MGBplus range of wheeled containers. When designing the MGBplus bin our product development team paid particular attention to areas of the container subjected to higher stresses during the lifting cycle, for example the front of the bin body and the wheels and axle supports. The unique shaping of the MGBplus front wall significantly increases the overall strength and rigidity of the body. Combined with the reinforced axle housing and solid steel axle, this new body design ensures that the bin will consistently withstand the pressures of present day waste management procedures throughout its lifespan. The bin is compliant with EN 840 and RAL and is “noise reduced” since it does not exceed an operating noise level of 92dB. A number of unique accessories is available, which include lid-hinge reinforcement clips and an optional foot-step which clips over the axle and allows for easier manoeuvring of the bin. The MGBplus can also be fitted with a lid which can be opened from the front and from the back. In summary, the Kliko MGBplus wheeled bin represents both the latest development in wheeled bin technology and Craemer’s ongoing commitment to product development and quality.